An updated release of Pretty Good Solitaire (for Windows) is now available. Version 14.4 is available for download from http://www.goodsol.com/download.html . - Crescent Fan - this is Fan with a Crescent-like redeal. - Five Stacks - an addition game, pair ranks that add to 13 like Nile and FIve Piles. - Pyramid Clear - a Pyramid variation where you win by just clearing the cards in the Pyramid rather than pairing all of the cards. - Quadruple Russian - a 4 deck variation of Russian Solitaire. - Red Hand - a variation of Twister. A full list of all of the 840 games in version 14.4 is at http://www.goodsol.com/pgs . 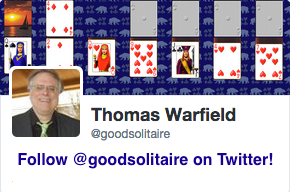 This is the 19th anniversary edition of Pretty Good Solitaire. The first version was 19 years ago in July, 1995. It contained only 5 games. 19 years and 835 games later, it is still going. You can download Pretty Good Solitaire version 14.4 from http://www.goodsol.com/download.html . Or, if you have a previous version installed, you can run the game, go to the Internet menu, and select "Download Latest Version". Be sure to exit the game before you install. Pretty Good Solitaire version 14.4 is a free update for those who originally ordered version 13 (ordered after April 12, 2011) or those who paid for an upgrade during that time. However, it is not a free upgrade for those who originally ordered version 12 or earlier. Full details on upgrading are at http://www.goodsol.com/upgrade.html . If you have lost your code and need to type it in again, you can request that your registration code be sent to you again from http://www.goodsol.com/regusers.html . Note that you should only need to type in a code again when installing on a new machine or after a WIndows upgrade or reinstall. 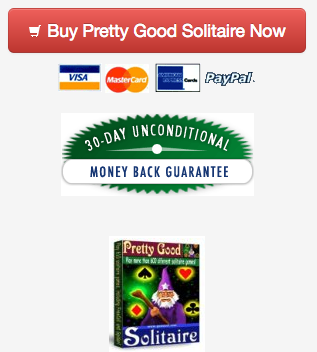 Pretty Good Solitaire version 14.4 is US$24.95 for immediate electronic delivery. If you want an additional CD, there is an option to add $9.95 shipping. You can order online from http://www.goodsol.com/order.html . In addition to installing the basic game, the CD also installs all of the currently available extra card sets. Our next new version will be the 550 game update to Pretty Good Solitaire Mac Edition with 50 new games. Watch for it soon! Pretty Good Solitaire for iPad recently updated to 550 games. See it in the AppStore on an iPad at http://www.goodsol.com/ipad . Remember that we have bonus downloads (the Cat and Dog Card Sets) and special discounts for newsletter subscribers to Pretty Good MahJongg and Action Solitaire at http://www.goodsol.com/newsletter.html (subscribe for access). This game is at Pyramid Clear.